The NEC (National Exhibition Centre) in Birmingham is one of the largest exhibition venues in Europe. 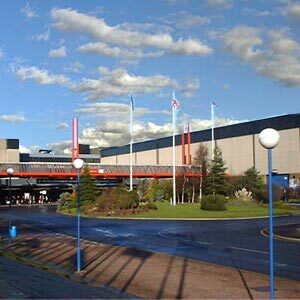 With 20 halls accounting for about holds 190,000 square metres of space, the NEC stages nearly 180 exhibitions a year. This venue has seen world-famous shows such as British International Motor Show and Crufts Dog Show. The Birmingham National Exhibition Centre has been instrumental in encouraging and developing smaller specialist shows as well as hosting large-scale international fairs. The flexible halls offer myriad possibilities that make it possible to hold extensive conferences. The Birmingham NEC Arena is located within the NEC Complex and can seat nearly 12,300 people. Since 1980, the NEC Arena in Birmingham has been hosting concerts, some of them being famous performances by Sir Cliff Richard, Tina Turner, Elton John, Pavaroti and U2. The NEC Arena in Birmingham offers services for promotion and successful box-office operations. The Horse of the Year Show is regularly held in this venue as also the World Figure Skating and World Gymnastics Championships. World Wrestling Entertainment and Supercross events have also been conducted at the NEC Arena in Birmingham.